A. Deblais et al., Phys. Rev. Lett. The self-organized movement of the little scamps gives insight into how microbes navigate. It’s a classic thought experiment: If you put a bunch of tiny little jumping bean-like robots in a room together, will they just run into each other? Or will they figure out how to organize? By classic, of course, we mean something that a bunch of French physicists decided to try out because hey, science should be fun. Researchers put a whole bunch of tiny, pill-shaped toy robots in a circular pen and let them mindlessly zip around. The resulting behavior, which looked somewhat organized, could give scientists insight into how microbes like bacteria move around. 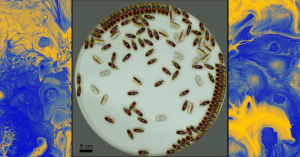 It could also give rise to better swarm robotics of little (smaller than the toys used in this study, for sure) pill-bots that can move around inside of an organism, perhaps to deliver a medication. When the bots were switched on, they started to act like gas particles, as described by Phys.org. That is to say, moved around in what’s called a “random walk,” a type of model used by biological and medical physicists to describe a mindless entity (like these very simple bots) that’s just as likely to move in one direction as it is another. But then the bots began to cluster in two groups on opposite sides of their pen, pushing against the outer boundary. When the pen was replaced with a mobile, flexible one that the bots would be able to push around with collective movement, they managed to squeeze the entire thing in between the small opening in a nearby wall. Any direct applications of these cute little bean-bots are still pretty speculative, as this is some early work, it’s possible that models based on their behavior and pathways could result in a better understanding of microbial biology. In particular, how bacteria navigate and invade cells or how to better control a robotic collective in a coordinated fashion.